O'zapft is! Call of War celebrates the Oktoberfest with a special Speed Round Event and extra high victory rewards. So that all generals also have enough gold for a visit to the beer tent, a round of "test your strength" or the wild ride on the "tank-chain-carousel" there will be a special offer for each participant to improve their Oktoberfest cash register. 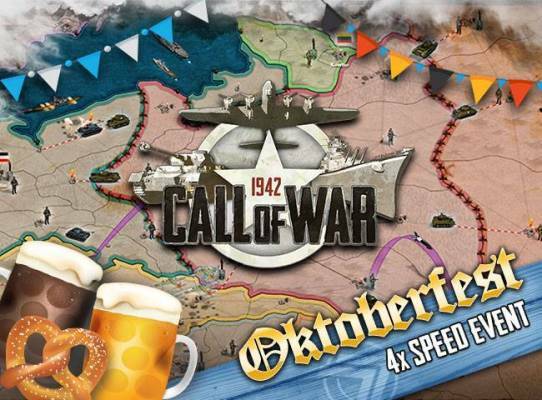 Alongside with the Oktoberfest Event there will be a special shop offer for every player - you get double the amount of premium currency for one hour after your initial login on Call of War. 1942: Call of War is free-to-play Strategy MMO game, the player can play on all the devices (PC on Browser, IOS and Android) see the links for each one, with the same account, Call of WAr World War 2 Tank clashes, Naval battles, Air combat. In Call of War you rewrite the course of history! Call of War, also known as 1942: Call of War, is a f2p, multiplatform game, browser-based real-time strategy game which invites you to command the forces and fight the battles of WWII. Take over the control of one of the warring nations during World War 2. Conquer provinces, forge alliances and build your economy. Research top secret weapons and become the one true superpower! Intelligent alliances or ruthless expansion, wunderwaffen or mass assault? It is up to you which way you choose!